There are rules for food writing. There is an unwritten law for most food bloggers in Columbus. Violation of the law leads to a sideways look as well as concern and discussion about breaking the code. I follow the code within the realm of reason. A review can not be bought, bartered, traded or guilted. I say no all the time to free offers, free food and perks. On occasion, I say yes. I will say yes to write about something I believe in or something I already like or planned to consume. In my online history I have (with a noted disclaimer) written about The Chef’s Garden, Cleveland, Rogue Root Beer and Dine Originals. At the present I have overdue debts to Sandusky and Huron Ohio as well as Pittsburgh. In the case of 89 Fish I am breaking several of my other rules including. “Don’t write about restaurants that base their menu in fish (since I am allergic to fish). I am a food writer (with a blog vs. a blogger that writes) that as a general rule does not write reviews. Reviews are for critics under the auspices of being objective in a field that is subjective on the best of days. My opinion has been that no one needs my help finding a bad place. I write about things I like because it is much more enjoyable and rewarding that ripping something apart. I get offers like the one below and most often I say no. We are excited to announce the opening of 89 Fish & Grill, conveniently located in the Arena District at 89 E. Nationwide Blvd. Because you know what’s new in Columbus and where to find all of the good eats, we would like to cordially invite you to join us for dinner as a part of our debut into Columbus restaurant society. 89 Fish & Grill was created to offer an elegant experience in a casual atmosphere with a seasonal menu defined by the modern way of eating: fresh, local and sustainable. The seafood is flown in fresh daily and prepared with seasonal Ohio ingredients. The natural deep wood and picturesque bar has house-made specialty cocktails and an extensive wine list. Columbus needed a new way to experience what’s fresh and 89 offers a literal adventure into great food, without driving to the suburbs. The fish may not be local, but we are. 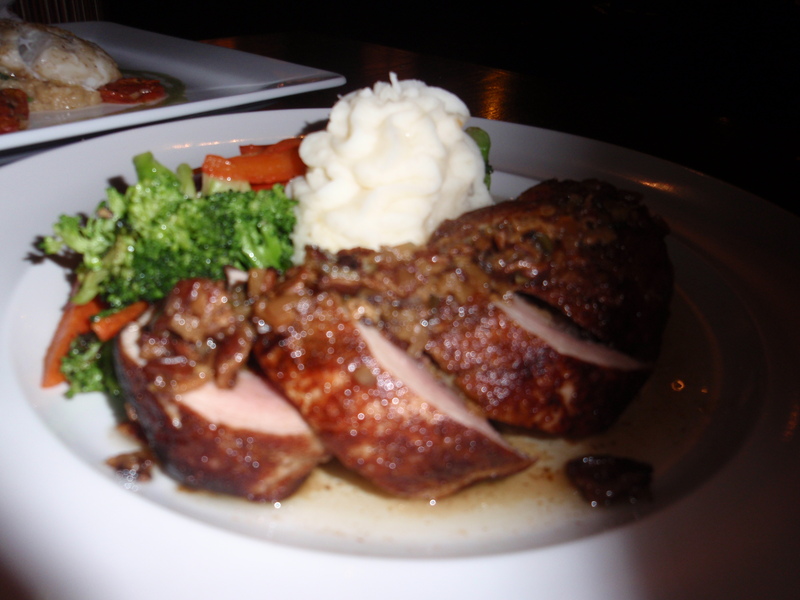 · Dinner is served 5-10 p.m. Your review of our restaurant and dining experience would be greatly appreciated as we are eager to celebrate this amazing gathering space and fresh food with others. We also encourage you to join our online community. Exclusive specials will be run through check-ins on Foursquare, Twitter re-tweets and more. 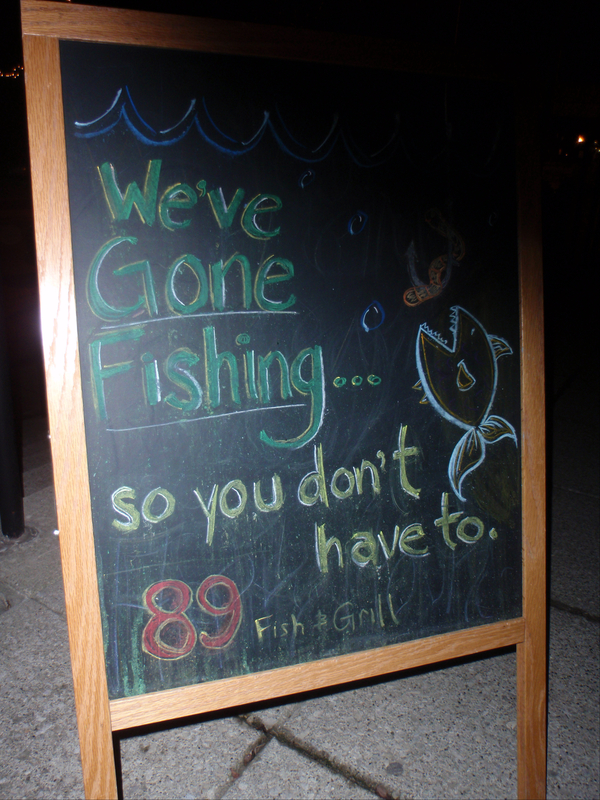 Please visit http://www.89fishandgrill.com. *Must make reservations or meal will not be complimentary. So as I said, I typically say no, but I said yes. Here is why. The request is well written and provides some background. It asks for a review but does not expect one. It provides guidelines and asks for a reservation. It was handled very professionally and I was given a budget but no guidelines. More importantly, as someone allergic to fish – I never rush out to a fish restaurant so it could have been years before I felt the need to check out 89 Fish. Many of the places I write about involve some type of culinary risk – but in the case of fish, I am not willing to risk my own money. My mission – find something on the menu that I could eat and would enjoy. In my experience most fish based restaurants offer a chicken dish, pasta dish and a burger and leave it at that. Did this place have the gumption to break that mold? Two other reasons why I said yes. This is a locally owned restaurant taking a risk on downtown. Although others are again opening up shop downtown – the masses have not started to follow yet, so I have to admire a restaurant rolling the dice in this economy. The front of the house is experienced. General Manager Mary Beth Zakany worked for Max and Erma’s in the early days (with Cameron Mitchell), then the 55 Group (with Cameron Mitchell) and them for Cameron Mitchell Restaurants for fifteen years. Chef John Beck in the back of the house worked for RJ Snappers. Owner Richard Stopper is a veteran of the 55 Group and RJ Snappers. To a large section of pre 1995 Columbus, the most important item to mention at this point is that yes – the restaurant does serve 55 salad dressing. Other things I liked before I crossed the door. The menu features Ohio raised Chicken and Pork. Cincinnati goat cheese and a house beer crafted in Zanesville. The menu denotes Vegan, Halal, Kosher and Gluten Free selections (however Straightedge Hippy is not noted). The website is simple and music free. Cutting to the chase. The pork loin. As described: Dried Fruit Stuffed Pork Tenderloin: Ohio pork stuffed with figs, apricots,cranberries, golden raisins and sage, sherry-bacon vinaigrette. It was perfectly cooked – just a hint of pink in the middle, tender and juicy, easy to cut but not soft texture with a combination of melt in your mouth and slight resistance to the bit at the same time. The flavor of the fruit was there when I wanted it but very muted. The potatoes were whipped in the style of my MCL memories. It was a very good dish for the $19.00 and a suitable entrée for a non fish eater. I would go back for that. So would my designated diner. The place is new and is working out kinks. My server might have been a bit less enthusiastic and could have had a bit more knowledge on the menu. All of these things will right themselves in time. Mary Beth was a pleasure to speak with and very well versed in what the house wants to bring to the table. In the short-term, I would ask that they add more Ohio and local beers to showcase to the three hotels filled with schools of visitors surrounding 89 Fish. Thanks for the free meal and the opportunity. I don’t mind breaking my rules for this pork loin. This entry was posted on February 26, 2012 at 3:01 PM	and is filed under CLOSED, restaurants. Tagged: 89 Fish and Grill. You can follow any responses to this entry through the RSS 2.0 feed. You can leave a response, or trackback from your own site. I ♥ fish and pork. Will need to check menu.